Renzo Olivo is a professional tennis player from Argentina. He played mainly on the ATP Challenger Tour and ITF Futures, both in single and doubles. His career biggest win came at the 2017 French Open when he defeated twelfth seed and Jo-Wilfried Tsonga in four sets. Olivo was born on 15 March 1992 in Rosario, Argentina. He is Argentine by nationality. Born in the mid-March, his zodiac sign is Pisces. Antonio and Mirian Olivio are his parents. As siblings, he has two brothers, Alvaro and Gaini; sister, Rosina. According to sources, Giampietro is a college student and pursuing her degree in social communications. Olivo's father motivated him to play tennis from the early age. His father owned a tennis club in Rosario. Olivo started playing tennis since he was four. Before being professional, Olivo was trained in France for four years. Olivo turned professional in 2009. He excelled both as in singles and as doubles. In 2011 Citta di Comma Challenger Series, Olivo partnering along with Federico Delbonis and won the final over the Martin Alund and Facundo Arguello in a simple set of 6-1, 6-4. For the title of 2012 Manta Open, Oliva partnering along with Peru player Beretta, and defeated Victor Estrella and Joao Souza. In 2013 Challenger ATP de Salinas Diario, Expresso, he loses in the final against the Alejandro Gonzalez. Following the month, Olivo participated in 2013 IS Open de Tenis in Sao Paulo Brazil. 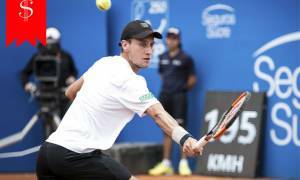 However, he made to the finals but losing the finals against the Bosnia player Damir Dzumhur. In 2016 Campeonato Internacional de Tenis de Santos, he won the final against the Brazilian tennis star Thiago Monteiro. The championships provided him prize money of $50,000 USD. That same year, Olivo bagged the 2016 Copa Fila Championships upon defeating Leonardo Mayer in the final. Olivo has dragged the attention of countless people towards him. Cori Giampietro is the girlfriend of Olivo. The lovely couple is dating for some months now. It is unknown how they met but the couple belongs from the same town in Argentina. Currently, they are spending blissful moments together. The lovebirds were frequently spotted in several places like restaurants, malls by their fans. Apart from tennis, he follows soccer. Lionel Messi, Sergio Aguero, Gonzalo Higuain are his favorites. Olivo has hobbies of going out with friends, TV, movies, and parties. His ideal growing up is David Nalbandian. Mostly, Olivo plays in clay surface and his favorite shot is forehead. He is fluent in Spanish, English, and French. Olivo has reached the age 25 now. He has a height of 5 feet 9 inch, which is around 1.8m. He has a healthy weight of 73 kg. Olivo is known for his athletic ability, hand eye coordination, and perfect ball judgment. He won several major tournaments. His dedication and devotion paid him a fortune of earnings. As prize money, he has accumulated more than $700 thousand U.S dollar. Olivo has long lists of fans and followers on Instagram and Twitter.